Giandomenico Amendola has been, until 2011, professor of Urban Sociology in the School of Architecture of the University of Florence where he headed the CityLab, Multidisciplinary Urban Research Center. He has been professor in the University of Bari and in the Politecnico of Bari. He has been teaching and lecturing in many outstanding foreign universities (e.g. MIT and Columbia University). 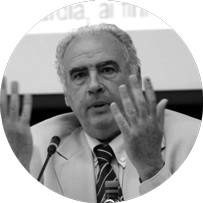 He served as a President of the Associazione Italiana di Sociologia ( Italian Sociological Association). – Giandomenico Amendola, La Città postmoderna. Magie e paure della metropoli contemporanea (Laterza, 2007); Spanish Translation: La Ciudad Postmoderna (Celeste Ediciones, 2000). – Giandomenico Amendola, Culture and Neighbourhoods: perspectives and keywords (Council of Europe Publishing,1998). – Giandomenico Amendola, Scenari della città prossima ventura (Laterza, 2000). – Giandomenico Amendola, Anne Beamish, Dennis Frenchman, William Mitchell, Technological Imagination and the Historic City: Florence (Liguori, 2009). – Giandomenico Amendola, Il brusio delle città. Le architetture raccontano (Liguori, 2013).